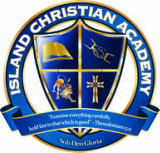 Island Christian Academy is a classical Christian school which currently serves 80 students in grades PreK-12. We have been a school for over 25 years and have in the last several years moved toward adopting the classical model of instruction. Each class, with the exception of PreK and Kindergarten, incorporates multi grade levels (1st/2nd, 3rd/4th, 5th/6th, 7th/8th, 9th-12th). Our school day runs from 8:45 AM - 3:30 PM. Maximum ratio is 18 students to one teacher, with the exception of Pre-Kindergarten, with a maximum of 8 students to one teacher.